Today I will be talking about my dives in the Red Sea, a highlight of my trip. Yes, Petra was amazing, Wadi Rum was fun but the Red Sea was an experience altogether different. Before I decided to go to the Middle East, I joined a Facebook group specially for Girls That Scuba. The content was helpful and the pictures shared were surreal. When I posted a question asking if it was safe to go to Jordan and Israel (to dive), the ladies were quick to assure me that is was very very safe. The founder of the group, Sarah then recommended her friend Omar and the Deep Blue Dive Center. I contacted them, had speedy responses to my questions and soon enough, I was set to go. I pulled up in a taxi at the dive shop in Aqaba from Wadi Rum, all hyped up to dive. When I entered the shop, a blast of cold air welcomed me in. The first thought that came to my mind when I took stock of the dive center was, “Wow, color me impressed!” I had never seen such a lovely dive center in my entire dive experience (which to be fair has only been two years). I was greeted by Mohammed, the Operations Manager and was asked to sit down. After waiting for a while, he suggested that I drop off my bags at Omar’s home (where I would be staying for my duration in Aqaba) before going back to the shop to prep for my diving. Abdallah, a Dive Master was then introduced to me and he drove me over to Omar’s. Omar and his lovely dog greeted me and led me to the guest bedroom. After dropping off my stuff and packing my diving gear (I only brought my rash guards, mask and GoPro), we headed back to the dive center. Abdallah was then tasked with outfitting me for my gear and making sure everything fit. After a quick goodbye to Mohammed and Omar, I was quickly ushered to the car that would bring me to the South Beach. Abdallah settled into the driver’s seat and we were off. Lucky me, I’ve always preferred diving in small groups but I never had the opportunity to be the only diver with a Dive Master. Score. But I had a tiny worry, all my dives (20+ of them) had been boat dives…I wasn’t mentally prepared to do any shore dives. But Abdallah assured me that the shore dives were easy – we didn’t have to fin far to get to the sites. We hopped out of the car and I was asked if I knew how to load my tank. Yup, I’ve always been ‘spoiled’ when doing boat dives as the boat crew would always be the ones that load our tanks and check them. We just had to strap up and jump into the water…which can be a dangerous thing…you should be the one that check your own tank. It was rather easy…I did my best and he helped me when I forgot some steps. “Now, turn the pressure gauge face down before you open your air.” Why? I asked. “Because there are times when the pressure gauge glass can explode. So never, never hold it face up or point it at your friend.” He went on to give some explanation as to why it can happen. I absorbed the information and strapped on my tank. And we walked down to the beach with 20+kg of gear on our backs. My first dip in the water had me shivering. It was cold! But my body soon acclimatized to the cold and we finned out. This first dive was to ‘get my feet wet’, so to speak. Abdallah wanted to add in mask clearing but I refused to do it. 😀 We descended down into the deep blue and was asked every few seconds if I was okay. I was okay…until I wasn’t. One of my ears could not equalize and it was starting to hurt. I motioned that I had problems with my ear and we started ascending a bit. It helped. So we started going deeper. Then I couldn’t equalize again. Abdallah gave me the thumbs up sign and we started ascending a bit again. It went on for a while…all the way into the air pocket of the shipwreck. I pulled off my regulator and gasped. We left the shipwreck and went out of the ship. Soon after, we ascended. I was a little upset that my ears let me down. What did I do wrong? Did I wait too long before equalizing? But I didn’t beat myself up over it, I was pumped to have done my first wreck dive – even if I didn’t really explore the wreak. Then it was time to head back into the car and head to our next dive site. I changed my tank for the second dive and we waited a bit before descending. Abdallah and I got to know each other better and talked about family, religion, diving, traveling…etc. Then we had to stop talking to go under. If the ship took my breath away because it was kinda massive, the tank took my breath away because of the myriad of colors. We went a few rounds around the tank and I was gasping at the schools of fishes and the multiple lion fishes. Midway, Abdallah tapped me. What was it?? I turned and saw him pointing to the ground. I strained to see and went down deeper. He grabbed my arm to stop me from going down too fast…then he motioned for me to stop. I stared at the sand…what was I supposed to see? Two eyes stared at me. I took a deep breath and finned away…and found myself surrounded by jellyfishes upon our ascend. Our second dive quickly finished and we did our third dive before heading back to the dive center. At the center, I took the best hot shower ever and headed out for a meal with Abdallah. That night was spent exploring the city. The next day, Abdallah and Belal (another DM) informed me that there were three American guys who were going for the “Discover Scuba Diving” session. Basically, it’s for people to try diving before deciding whether they want to take the OW. I was told to wait for them to finish before Abdallah would bring me for my dives. I sat through the guys’ briefing, kicked my feet back at the beach to watch the numerous divers prepare for their dives. Soon enough, it was my turn to descend. This time round, I was informed that we would try to explore Cedar Pride again. Remember my first dive and how it was a failure? Well, this time, I managed to explore the inside. It was pretty cool. There I am, feeling a tad proud that I did my first wreck dive. All too soon, my last dive was done and it was back to the dive center for a shower. That night, I was to have dinner with Omar and Abdallah. But first, Omar had something on so I was dropped off in the city to slowly make my way dive center to meet Abdallah. Aqaba is safe. Safe for solo female travelers. Just sayin’. My two days in Aqaba passed by too quickly and I had to leave the next morning. 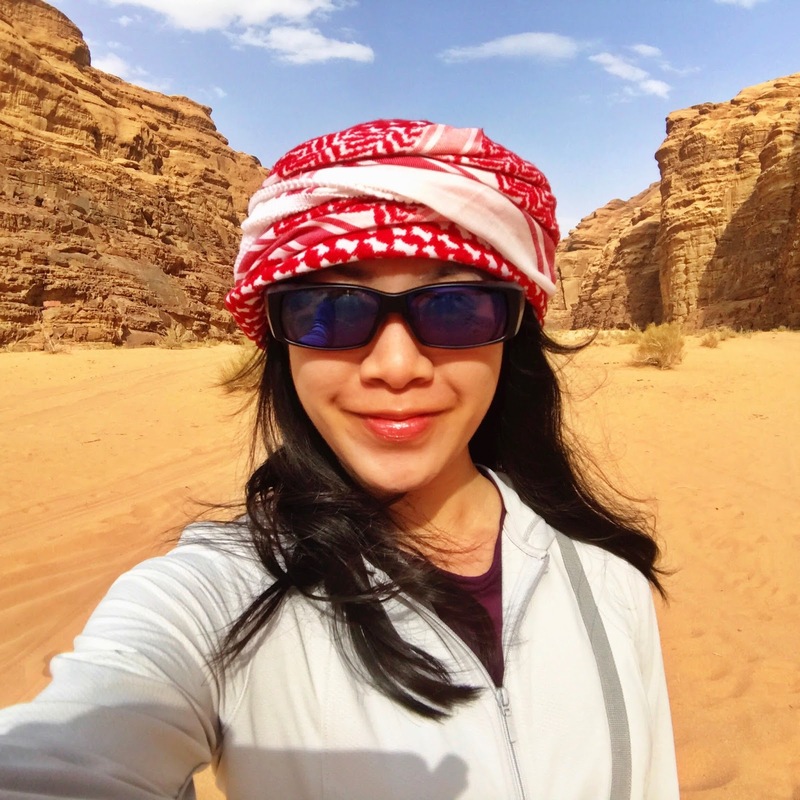 Aqaba was the first time I was ‘alone’ in Jordan and to be honest, I was apprehensive. But the friendliness of the dive team (I had a pretty fun time sitting in the center and chatting with the sweet receptionist) quickly drove away any fears and apprehension. If you are looking to dive in Aqaba, GO TO DEEP BLUE DIVE CENTER and look for Omar – he’s an instructor with Deep Blue. I was looking forward to dive with him but our schedules couldn’t meet. Trust me, you will not regret going to Deep Blue. From recent FB posts, it seems like they have moved their location to the beach area. When I was there, their center was pretty much in the heart of the city – so moving to the beach seems like a smart, convenient move.